HONG KONG, Sept. 28 (Xinhua) -- Hong Kong chief executive and Hong Kong's government have all along been listening attentively to the members of public, respecting and accommodating different views in the society as well as are committed to maintaining a diversified society. The public are encouraged to express their aspirations peacefully, rationally and lawfully, said a government spokesman on Sunday. Responding to the announcement that "Occupy Central" movement formally started on early Sunday morning, the spokesman said that the Hong Kong Special Administrative Region (HKSAR) government is resolute in opposing the unlawful occupation of the Central Government Offices or the Central District by "Occupy Central". The Police are determined to handle the situation appropriately in accordance with the law. 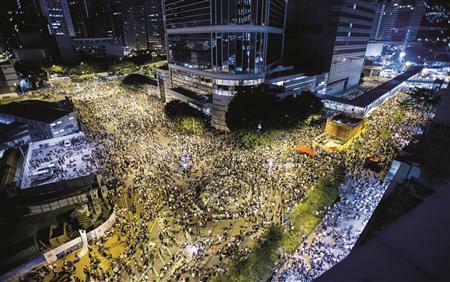 The spokesman said that after detailed and careful deliberation of the actual situation of Hong Kong and the views of various sectors of the community, the National People's Congress Standing Committee (NPCSC) has made decision on Hong Kong's constitutional development in strict accordance with the relevant provisions of the Basic Law. It is legally binding. "The NPCSC has decided that the HKSAR people will elect their next chief executive in 2017 by universal suffrage. This is an important step forward in the constitutional development of Hong Kong and is surely better than a stalemate," the spokesman said. "The chief executive and the HKSAR government will, in accordance with the Basic Law and the relevant decision of the NPCSC, try all efforts in a bid to implement the election of the chief executive by universal suffrage in 2017." The spokesman said that HKSAR government will launch the next stage of the consultation on constitutional development shortly. It appeals to various sectors of the community to engage in rational discussions through peaceful and lawful means, to reach a consensus while accepting differences and to allow the 5 million eligible voters in Hong Kong to elect the chief executive in 2017 by one person, one vote.